Spring is the time for renewal and regrowth, so it's a great time to examine your life and goals. Now that I have two kids, it seems like time is speeding up faster and faster every year: there are so many things I intend to accomplish but it seems like I rarely actually finish any of them. Obviously I need to revamp my way of doing things. But where should I even start? Suzy Welch is an author and columnist (Business Week, O Magazine) who specializes in writing about the work-life balance. She is also the mother of 4 children, ages 14 to 19. 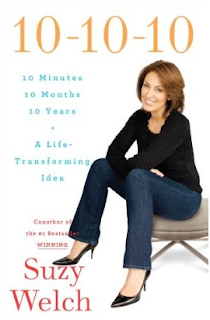 Her new book, 10-10-10: A Life Transforming Idea, explores the way people can empower themselves by simply asking three questions before making any decision, no matter how big or small: "What will the consequences of my options be in 10 minutes, 10 months, and 10 years?" What is really refreshing about the 10-10-10 approach is that it transcends personal belief systems and applications. Unlike most business or self-help philosophies, Welch doesn't seem to believe that there is only ONE right answer for any question. In fact, you can use the 10-10-10 query with your own core values and for your own needs. For me, it helps me to not bite off more than I can chew- whether it's in volunteering for charity or parents' groups or even framing out how I would like to see my children grow up. It's so important to recognize that every action will impact your life somewhere down the road but it doesn't have to be a dogmatic bummer! I'd like to see Roo and Jasper utilize 10-10-10 to make informed decisions, even though they're a bit young to understand the weightiness of time. Thanks to MotherTalk for introducing me to this book. I doubt I would have found it on my own! I saw her on one of the morning shows, and it seemed like an interesting concept. I wish I had paid a little more attention.